I got the organizing bug today. As you may know, I have a Liberty Deluxe model of Casita, which means I have bench seats facing each other from opposite walls. Well, I’m weary of pulling out the laundry basket that resides underneath the bed every time I want some clothes. Remember I took the cushions off one of the bench seats when the catalytic heater was installed below. I put the cushions in the PTV (Perfect Tow Vehicle). I’m sure you’ve seen these white, plastic drawers at Walmart. They aren’t too expensive and they’re pretty durable. I make an arrangement of these drawers on top of the fiberglass bench seat. The white looks good with the white fridge and white fiberglass base. Only trouble is, the drawers themselves are clear. I don’t want to look at all the stuff inside of them. And I certainly don’t want visitors looking at my unmentionables in one of the drawers! The drawers inside the drawers! Oops, I mentioned them. I’m going to put contact paper on the drawers to hide their contents. Every cubic inch needs to be functional when living in a small space. You can see one of them has contact paper on the front. It looks a little strange now, but I think it’ll look good when all of them are done. I got tired of cutting and fooling with contact paper. I have to procrastinate now and then or I get ill. Gee, it’s so nice to have my clothes in drawers! Another nice thing is the big, white surface on top where I can place things and not lose them. One of the drawers holds kitchen tools. The Casita kitchen only has one small drawer, which holds my silverware, a can opener, and not much else. When I finish covering the drawers, I’ll take a photo so you can see the final result. Next I tackle the closet! I can fit a lot of things in here now! I’ve seen other Casita owners do this. I got one of those shoe holders (cloth) that hangs from the rod in the closet. Then I inserted plastic boxes and plastic drawers. I’m going to get some strong elastic to sew across the front of each section. To the left of the shoe holder, I’m able to hang my winter coat. To the right I put the extension rods for the awning, an umbrella, and the broom. Below the shoe holder is the bag of dog kibble. I’m also storing totes full of miscellaneous stuff down there (not shown in photo). See the wire holder on the door? I’ll put spray cans there . . . bug spray, glass cleaner, air freshener . . . which I’ve been storing in the PTV and aren’t at all handy. In fact, I’ve got to do a major search in order to find where they are! One of my goals is to install a rod across the back of the PTV so I have a place to hang clothes that get wrinkled placed in a drawer. It’s not necessary for that type of clothing to be in my living quarters. Gee, I am so proud of my accomplishments today! I love playing around like this inside my little home, making it better, more liveable. The wind died down late yesterday, and the sunshine is back! I take a break from organizing to sit outside with the crew. I read a couple chapters of the Tony Hillerman book loaned to me by friends, Chuck and Geri. It’s fun to read a story that has its setting in the Southwest and that teaches me about Native American culture at the same time. I can look at the real mountains on the other side of Elephant Butte Lake and imagine some of the scenes from the book. I like for Bridget and Spike to spend some time outside on nice days. They can see passerbys, human and canine, from their pen. Puttering in and around my house-on-wheels is a lot of fun for me. Simple things make me happy. I am surprised again and again that anyone wants to read about my daily life. Stop and think about it. I never do anything very exciting. If it weren’t for friends inviting me places, I never would’ve been able to write about that great restaurant or the excursion to a ghost town. Mostly I write about pretty ordinary stuff like storage or what I put in my crockpot, for heaven’s sake. Yet here you are reading my blog. This entry was posted in Simple living and tagged blog, casita, fulltiming, organization, spacesavers, storage, Tony Hillerman. Bookmark the permalink. Ohhh good doing on the drawer fronts! That is a classy way to dress them up and hide your ummmm *drawers*, Classy Casita! If you get further south into Arizona, there is a good book called “A Cowman’s Wife” by Mary Kidder Rak. ISBN-10: 1432571958 She wrote the book while they lived on a ranch up high in the Arizona desert. It’s also one of those as you are there reading it, and looking at the very mountains and valleys that are in the book as you read! Here is our blog post about visiting the actual ranch the was in the book! Hi! Thanks for the book recommendation. I can put it on my kindle. I’ll check out the ranch. Thanks for the link. M K Rak also has another book, -Mountain Cattle- and it’s just as good as her first. However, both books are getting harder to find since she died some years ago and is buried in Tucson. Rather sad that when her husband died, she had to move down to Tucson, but the ranch was too hard to manage at her age then. Thanks, Emjay. I love books about country life or ranch living . . I checked amazon and they have it through other sellers, but only in hardbound ($20). No……Thank you!!! I really enjoy your stories. I’m glad you enjoy my writing. I don’t think I’ve ever welcomed you to my blog . .. so here goes . . . . Welcome, Royce! I made a storage discovery today that you might like. I was looking for something to put in the shower to hold shampoo, soap, etc. Something that won’t spill those things out on the floor. There were the usual wire racks that hang from the shower head (I haven’t got a fixed shower head). There were stopper-held racks. Nothing looked like it would withstand the bouncing around involved in travel. I asked a clerk about it, and she led me to a mesh thing with fairly deep pockets, made to hang on the inside of the shower curtain by the same hooks the shower curtain uses. Perfect? You can put anything in these pockets from a bar of wet soap to a tall shampoo bottle. The contents are perfectly visible through the mesh, and unlikely to find their way out unless somebody reaches in to get them. If the mesh gets grody, just pop it in the wash. All that for under 4 bucks. Works for me. I only open one end of the curtain anyway, and the weight of the contents at the other end means I don’t have to seal the curtain on both sides every time I climb in there. I couldn’t find this on line to show you, but it’s in the store. About the cheapest thing in there. You know, I think I have what you are talking about. Only I put them on the shower wall with two suction cup hooks. It kept falling off the wall, so I gave up on it. I like the mesh pockets and all. Like you said, you can see where everything is. I’m going to get that thing out again and hang it with the shower curtain, like you described. Thanks for the idea! That was my next storage problem to solve. Susan. I have 2 of those like Bob said in our shower. They are great. The mesh holds everything in but the water. They dry really fast. I have another shower mod I can recommend. It’s not for everyone, but I think it’s the best thing I did to the rig. I boondock a lot. Or did. A lot. Almost exclusively. And for me the hardest thing to control about the limited water supply was the shower. I just like the feeling of hot water on my back so much that I tend to zone out. I suspect my eyes roll back in my head, but in any case time slows to a crawl while gallons of the precious stuff flow heedless to the sea. In spite of that, the supplied demand shower head seemed wedded to a tepid and unsatisfactory output, barely able to knock the soap off. Then one day in Home Depot I noticed the familiar garden hose nozzle with dial-a-flow, from needle to soaker. I had to get a thread adapter to connect to the shower fitting, but from then on I could get a decent shower out of limited pressure. The needle setting is also good for washing out the toilet. But the … ah… “deadwoman” switch means I don’t use water without intentionally squeezing the handle. I don’t remember if you have an outside shower. I didn’t. But by adding a six foot extension that looped down to the floor of the shower, I was able to reach outside the front door to wash off boots or such. Hypothetically even dogs. Very, very interesting, Bob. I don’t have the need to work on the water flow in my shower, at least, not now, as I’m using campground showers. There may be a time when I’ll want to do what you did. I appreciate you explaining it here. I did order the outside shower. I’ve used it once on a very dirty dog named Spike. Another thought: I use a small, plastic mesh basket that sits on the floor of the shower and holds necessities since the walls of that shower are lined with vinyl and won’t hold anything stuck to them. The shower curtain is an integral part of the ceiling so the hooks won’t hold the mesh bag. I’ve been using a dishpan on the floor to hold things. Your idea is better. If you don’t want to do the contact paper on the drawers, you could get some spray paint made for plastic and spray the front of the drawers–either inside or outside. I have used that spray paint for plastic. When I was a teacher in another life, I used those plastic drawers on wheels to store classroom supplies. I spray painted them burgundy to match my room decor. It looked great. After a while it does scratch off. That’s why I’m using contact paper. Plus the paper has a bit of a pattern which warms up the look a bit. Many like to read what you write for the simple reason that they themselves wish their life was so simple that their biggest concern would be “now, how to hide my unmentionables from view?”. Keep on with what you are doing. Maybe you’re right, John. It’s a mystery to me. What’s going to keep the plastic drawers from sliding around and/or falling off the bench when you travel? Some large velcro strips might help, unless you’ve already figured out something better. Or, some of the no skid stuff you put under throw rugs in between and under them might be enough. First off, the boxes do interconnect somewhat, not much. I have some stuff that was recommended by one of my readers way last Spring. You warm it in your hand, roll it up in a ball, and squish it between things to hold them. It supposedly will hold pictures on a wall, pretty good stuff. Unfortunately I can’t remember where I put it. When I find it I’ll put it between the boxes and between the boxes and the fridge. I may opt for rolling duct tape, sticky side out, to put underneath the boxes. Before I move the Casita, I’ll place a folded quilt over everything. I may have to use bungee cords or tape to keep the drawers in . . . I haven’t figured that far ahead yet. LOL There’s a solution for every problem. I’m going to try your ideas, too. I believe that stuff is called “museum putty”. It is used to keep paintings hanging straight, or small objects upright. It is invisible if used correctly, and leaves no residue on the objects. It is a sort of tacky clay, and can be reused over and over, until it becomes dirty. It works pretty well, but not as strong as velcro. Can be had an most arts and craft stores. Chuck and I use that thick Rubbermaid rubbery shelf matting…. comes in rolls of different colors. I use it on The MotherShip’s kitchen counter tops where the toaster oven, drip coffee maker and several containers ride the road with us! Nothing slips off and it means I don’t have to totally break down every time we hit the road! Ditto on the mesh shower holders, we got ours at Dollar General for a dollar! IMO, puttering is underated. What a great idea – reading novels set in your setting! Love your mods – the contact paper solution is brilliant. When (if) you get tired of the pattern, you can change it out. Glad you approve of the contact paper. It looks pretty good. It’s not your grandmother’s contact paper. I can’t take credit for the book idea .. . that was Chuck and Geri. Nice of you to say so, Sharon! I really enjoy your blog. I’m about at the same stage in life and would like to go on a similar adventure in the near future. We ( hubby and I) have vacationed in AZ and NM for the last 5 years and have enjoyed it. We are considering “wintering” in NM, so the camping pass and state park info is interesting to me! You are like my “Rick Steves” of NM! Thanks for sharing. I hope my blog helps you in some way to plan and enjoy your future adventure. Some people say I’ll be able to winter in NM and others say, no way! I’m hoping it won’t get as cold as it got last year. 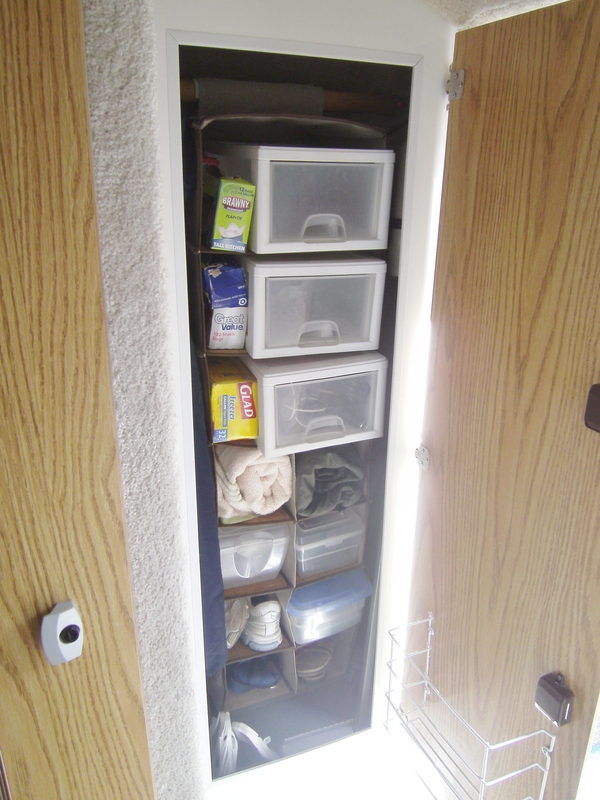 I have been using the plastic drawers for years in my little camper, a bungee works good to hold the drawers when I am in moving mode. I enjoy reading your blog and hope you continue to write about your solutions to problems that come up. Seeing the sunshine from your camera really brightens up the grey days up here in the northern climates. Oh, good! The voice of experience . .. I’ve got some bungees somewhere. I remember those grey days up north. If I can send you some sunshine with my blog, I’m only too happy to do so! Also you may like books by J.A. Jance. One of her series takes place in Bizbee AZ or the series by J Michael Orenduff. The setting is Albuquerque NM. I discovered them last year when we vacationed in Albuquerque. Thanks for the book suggestions! Oh Yeah! J.A.Jance books are not to be missed! The one in Bisbee is one of my favorites! I don’t have any intentions of RVing for a day, let alone forever…I don’t have any interest in living in the desert…I don’t own a dog…..but I love reading your blog and the replies you get. Of course, I love you very much, My Sister. Very funny! Isn’t it strange . . . we are different in so many ways, yet we do understand each other. No, you don’t seem like the rving-with-dogs-in-the-desert type! Yeah, and you didn’t want to be a cheerleader!!!! So glad we can laugh…be different…yet understand and love each other. Hey Sue– those look like great storage solutions! Very creative! I use one in my motorhome all the time. It’s lightweight, folds flat, and yet is very strong. Unlike other “criss-cross” style tables, the legs go under a bed or sofa so you can pull it closer than other folding trays. Also great to sit w/feet propped up and use as a laptop desk. Love Elephant Butte! I stayed there a few days this past Feb. Have you tried out your new Wave 3 yet? I had one in my T@B trailer in lieu of a furnace– so much more efficient and quiet! I’m not using the Wave 3 yet because I’m at an electric hook-up site. Might as well use the electricity and save my propane. I’ve enjoyed reading about your trip to the slabs. I tried to comment on your blog to tell you that, but for some reason it didn’t work. We also have the shower curtain with the built-in mesh pockets. We put the mesh pockets facing the door so we can stash things like extra TP that we don’t want to get wet while showering, but want handy so as not to be “stranded.” Also keep shampoo bottles, shower gel, etc. in them. I know the reason I’m addicted to your blog is that your writing style of everyday things makes for an enjoyable read, plus as I go about my workaday life, dreaming of the day we can retire, I can imagine myself living the life you’re living. So thank you for allowing us, total strangers, to be part of your adventures! I know exactly what you meant when you wrote “go about my workaday life, dreaming of the day. … can imagine living the life you’re living.” That’s what I used to do! It kept me from going crazy! I was grateful, too, for all the bloggers on the road. “I am so proud of my accomplishments today!” and well you should be, Sue. I think it’s time for you to come back to the cheaprvliving forum and share your storage solutions with everyone there. Besides, we miss you. Yes, I need to go there. Since I’ve been living in my trailer, I hardly ever go to any forums. Writing my blog and reading and writing comments, plus reading other blogs, has me ready to do something away from the computer! I should get back to the forums. I know I’m missing a lot by not doing so. Wow, JoJo! You’ve got some great ideas. You’ve got me thinking . . . It would be so handy if the storage drawers had something like a “butterfly” that could be turned to open or keep closed. After I answered Bob’s comment (above) about the mesh pockets, I looked at my shower. I can’t attach them to the shower rod because it goes across the door. It would hang down in your face when you open the door. But there is a towel rod that is attached to the door, so I might be able to hang the mesh pockets there. Figuring this stuff out is fun. Thanks for your help. Try attaching suction cups to the shower wall, then attaching the mesh pockets to the suction cup hooks. You can’t use ex-large economy sized shampoo etc, but smaller bottles weigh less and work! Chuck and I used our mesh pockets this way when we had our Casita! 3 years later we are using the same mesh bags in The MotherShip! Maybe you don’t think you do anything exciting, but to people like me that would love to be in your shoes it is exciting. I thank you for sharing it with us. Neat solutions, Sue!! Keeps the Liberty looking clean and neat! “Extreme Velcro” is a product I’ve used and been satisfied with. Grey in color,about 6 in strips, very heavy duty, both adhesive and velcro sides. Sounds like a good product. Thanks. Thank you for sharing your experiences. I love following you along! Tony Hillerman was one my most favorite authors. Love his books! I’ve read everyone one of them I believe. If I haven’t welcomed you to my blog, here it is! Welcome! Might have something to do with the fact that you have freedom, independence, and time to enjoy them. Folks who find themselves mired in less liberated circumstances (including me, for a while) can nevertheless get a vicarious taste of freedom through your blog. Consider going “commando” Sue, no storage or laundry issues, just complete freedom (lol). Yeah, Jack, complete freedom . . . until I’m behind bars! I LOVE reading your blog. I know what you mean about wondering why folks want to read about your every day life. I used to get the same thing with my blog but I don’t write much anymore. I’m in “burn-out and re-group mode” right now. But I’ll tell you, for me anyway, some of it is about the simplicity. Simplicity of your life, and simplicity of the way you write about it. Yet, for all it’s brevity, each entry is a delight and well written. I always admire good writers no matter the style. I love the way you organize your entries, with the large and colored headlines that say “hey…new thought here” and then go on to elaborate. And I appreciate the way you find enjoyment in life’s simple pleasures. Also enjoy reading about the crew. They sure are a funny pair. What a joy our little doggies are and such great companions. I like following your discoveries and evolution into living and storage solutions in a small space. We’ve got a big fifth wheel so our challenges are nothing like yours. But I’ve learned a lot of improvising and organizing in the 5 years we’ve been out. Props to you for making it work in a Casita. Hope we can meet someday. Think about Yuma for the winter. We found a private lot in the Foothills to rent for 2 months. Full hookups for $300 a month including electricity. You can find some in the Foothills for even less. Check Craig’s List. P.S. I think you’ll really like J.A. Jance and Joanna Brady books. I know I have. I really enjoyed reading your comment. I can understand why you’d be in burn-out mode re: writing. There are days when I don’t feel like writing my blog and I’ve only been writing a few months. I apologize for the delay of the appearance of your comment. WordPress put it in with spam and I didn’t find it until today. That’s interesting info on Yuma…. pretty inexpensive living. I hope we do meet someday . . .
We just signed for a Fleetwood Jamboree today, and my mind is full of what we need for to furnish and decorate it. Enjoyed reading the blog and picked up some ideas. We have pretty a good sized closet, lots of drawers and cabinets inside and plenty of storage outside, but the bathroom was one area I wondered how we’d keep soap, shampoo, tooth brushes in their place as well as how to decorate and not have pictures bumping against the walls or things sliding off tables as we’re driving. Was able to get several good ideas from this blog. Thanks for the information. You’re welcome, Lonelle. I wish you many happy travels in your Fleetwood Jamboree!